Ok, it's not the real Brian Burke, but it's actually more fun. 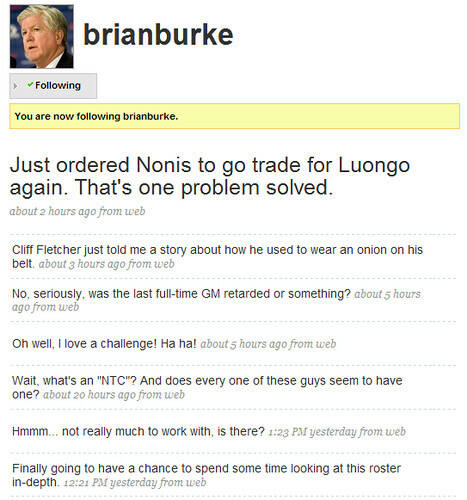 I'm following the fake Brian Burke on Twitter. About two hours ago he filled us Leaf fans in on what's coming down the pipe. "Just ordered Nonis to go trade for Luongo again. That's one problem solved". why can I not find this person on twitter? Twitter-Burke is hilarious. I wonder if the real Burkey will shut him down. Do you know of any REAL NHLers on Twitter? I see Pierre McGuire has a Twitter account and he's following Twitter-Burke. I hope he knows it's a joke!